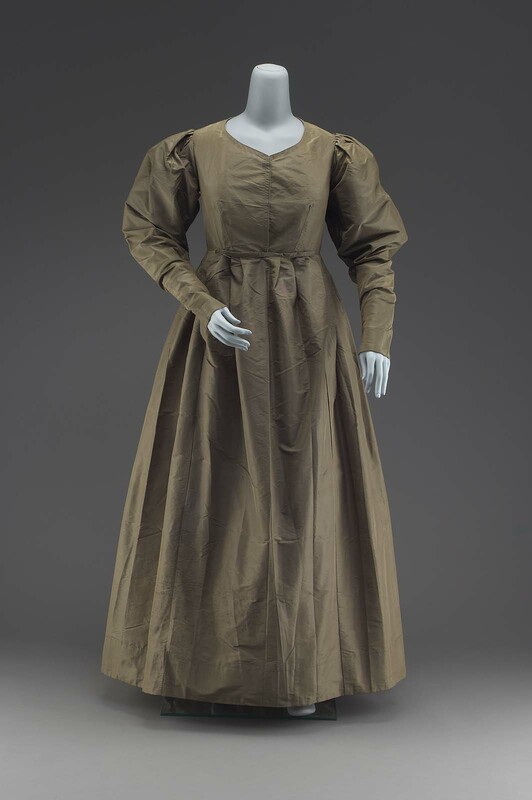 These sort of bottle colored dresses become common in the late 1830s into the 40s, there are examples of brown/copper ones at the Met. Your dress is magnificent! and your dating sound. 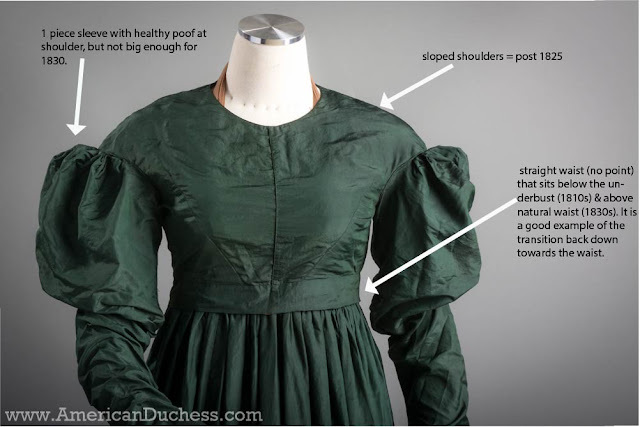 Here is one thing one needs to remember: dresses that often get saved are not everyday dresses, the saved everyday dress is a true rare commodity, and as such an important piece historically. And collections in art museums are much more interested in the "pretty" dress. 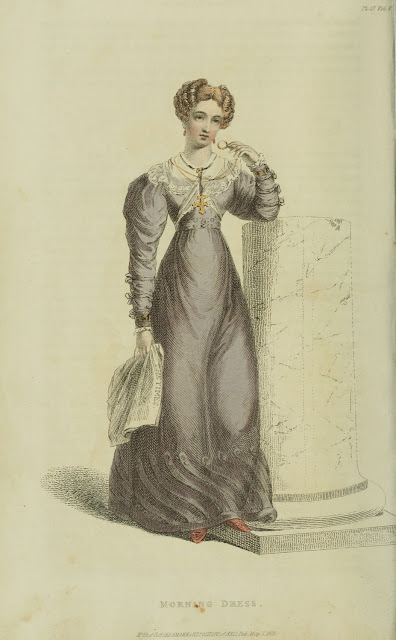 Dating is also fluid, which is why with a historical piece one often uses the "circa" - a dress can have elements from multiple fashion plates/years but it is the prominent one that provides the date. 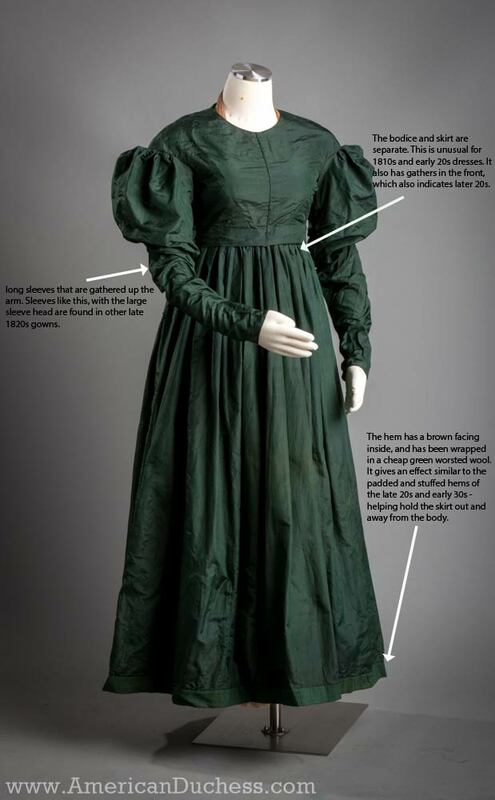 This makes me wish that local historical museums had the funds to put images of their collection on-line, as it would offer people a "truer" view of what everyday people wore. 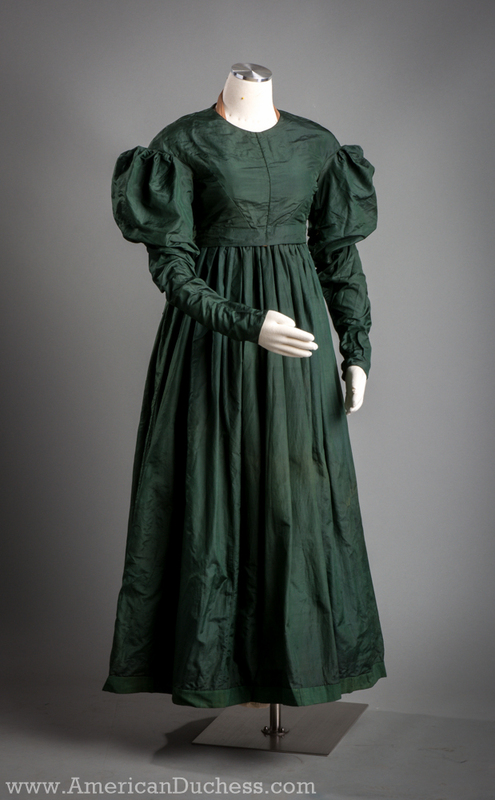 (I once tried to convince a museum director that their rare, c. 1825 cotton gown was a more historically important piece than a silk gown from the same, or later time period, but he didn't care and the entire collection was de-accessioned. Very very sad, all that lost history). I am still agog at the amazing find. Imagine the story it could tell - and which you are trying to decipher. I literally almost squealed with delight for you when you first posted about this dress. Sounds like you've done a great job dating it as well. I also can help but wonder, wouldn't every dress and gown have its own uniqueness? It has only been in more recent years that factory mass clothing is being made. Clothes where often made to order from a tailor or by the wearer them self. Every women would have her own tastes along with the latest fashions right? You pointed out the neckline was different, could it be that, that's due to the wears preference? Thanks for sharing this dress! Can't wait for the construction details!!! LOVE this dress! That color is gorgeous and it looks to be in fantastic shape. 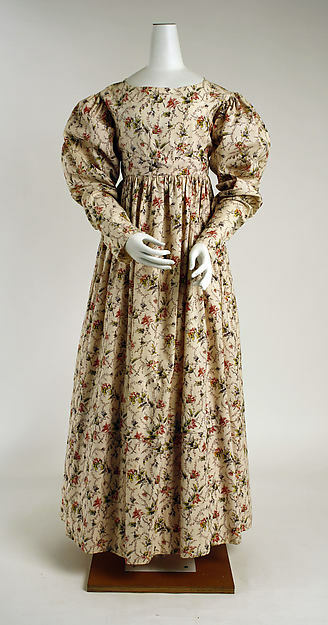 When you first posted about it, I immediately thought of the Quaker dress that you show in this post. These 'simple' day wear dresses are infinitely more interesting to me because we don't often see them. What a great find and I'm looking forward to the other posts. Bear in mind guys that this is silk taffeta. It may be plain and dark but it was clearly someone's very best dress. The way it was looked after and not hacked up. It may have been worn with a lace fichu or wide collar, or with a pretty bonnet or shawl that set it off more. oh so true. The plainness and darkness may have contributed to it being in a pile ... but now I have visions of it with a wide collar edged with lace perhaps ... and wish it could talk. Nice job dating! I think there's a possibility that it's Quaker, like your last example, and a bit later (dark color, no trim and no figuring/patterning in the silk, slightly odd construction), but it could also just have been owned by someone on the conservative side. The one thing that seems really strange to me is that very low armscye: typically for this period, it should be just at the point of the shoulder, but this is more like a ca. 1840 level, even on someone with broad shoulders. Curious! It reminds me a lot of the dark gowns you see in a lot of folk portraiture, with several prominent pieces of jewelry and sheer embroidered cap and pelerine. Like Nancy Gardner Brown, Anne Jane Carlisle, and Postmistress Rose. Oh, I'm not saying it's not a fashionable color! It's all of the aspects together that remind me of the few extant Quaker gowns I've seen. 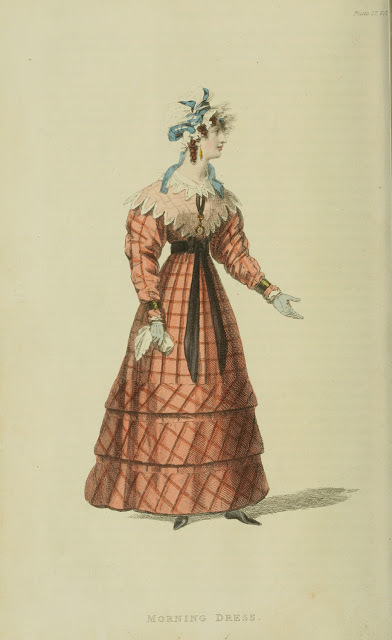 Quakers were fine with fashionable colors, as long as they were on the "sadder" side. I agree with your dating entirely, and it's consistent with what I've found in my researches in the archives at the MoL. I also think there's a good possibility that (since it's been saved) it'd be an earlier dress that's been reworked (and possibly re-dyed). I'd love to see interior photos when you've got a chance. 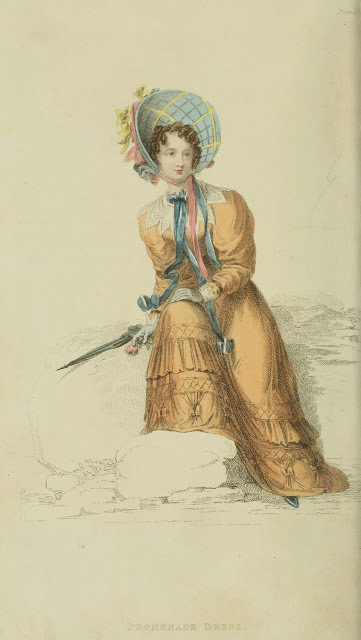 My one quibble is that the hem guard appears on a *lot* of silk and finer woolen dresses (even earlier, columnar ones), and it's not necessarily a stiffening - more a way to protect a tender textile from the ground/floor/fireplace/your shoes, etc. These still get applied to some theatrical costumes! One last thing - I'd love to see it with a proper belt and buckle! These transitional styles always look so strange without that one extra piece. Hi Laura! 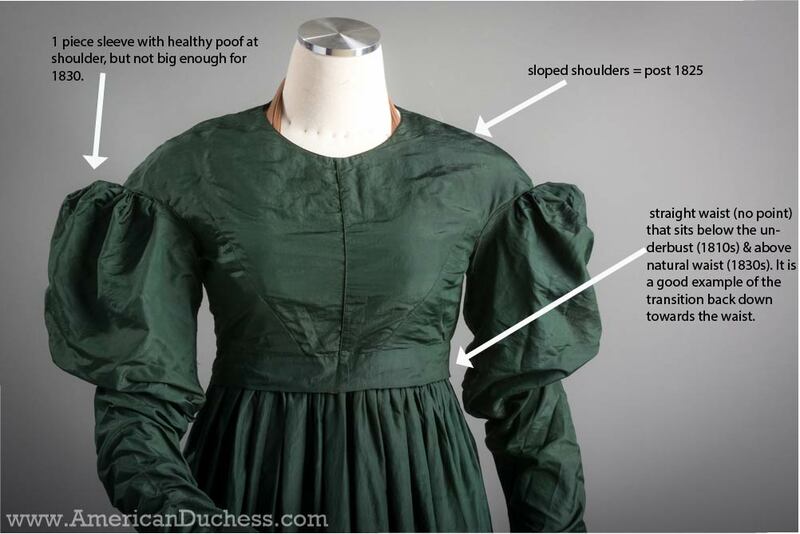 Do you have pictures or links to gowns that have a wool hem guard? I would love to see some examples, since most of the ones that museums have online/I've found are silk. I would love to be able to compare this gown to some other examples! So interesting to see how you dated this. I'm really enjoying following along with your posts!